Craftfulness is the joy of making, and the benefits it brings to your wellbeing (borrow Craftfulness below to find out more!). If you’re in need of a project, have a browse below! Craftfulness : mend yourself by making things / Rosemary Davidson & Arzu Tahsin. 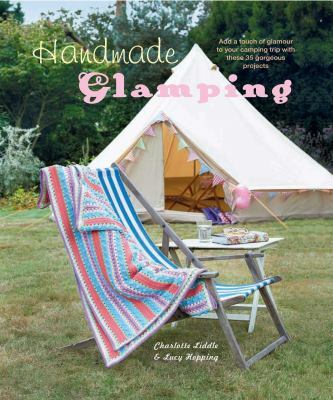 Handmade glamping / Charlotte Liddle & Lucy Hopping. The unicorn craft book : over 25 magical projects to inspire your imagination / Isabel Urbina Gallego. Beehive alchemy : projects and recipes using honey, beeswax, propolis, and pollen to make soap, candles, creams, salves, and more / Petra Ahnert. 350+ quilting tips, techniques, and trade secrets : how to be better at what you do / Susan Briscoe. Find some charming ideas in this collection of craft designs and make to give projects! Discover how to create unique and memorable art pieces for your friends and family. We have selected a variety of craft projects featuring stunning designs and creations. Take a look at the cutest range of baby shoes and booties to crochet – they’re so easy to make! Happy crafting! Crocheted baby shoes / Val Pierce. Super-cute felt : 35 step-by-step projects to make and give / Laura Howard. How to craft with paper : with over 50 techniques and 20 easy projects. Happy hexies : 12 hand pieced hexagon projects to stitch & love / Boutique-Sha ; translation: Kyoko Matthews. AmiguruME pets : make cute crochet animals / Allison Hoffman. “Crochet yourself a cute pet with the irresistible art of amigurumi! The ultimate party book for children : all you need to make your children’s party a hit! / Samuel Rice and Cissy Azar ; [photographer, Andy Lewis]. This month’s selections are packed with a great variety of quilting and knitting ideas for the new season! Browse through Pat Sloan’s teaching instructions and learn amazing quilting techniques. Explore some modern and chunky knitting patterns and choose your favourites for you and your family. Happy crafting! Pat Sloan’s teach me to machine quilt : learn the basics of walking-foot & free-motion quilting / Pat Sloan. Pat Sloan’s teach me to appliqué : fusible appliqué that’s soft & simple. Lucky charm quilts : 17 delightful patterns for precut 5″ squares / compiled by Lissa Alexander. Big knit love : 20 chunky knit fashions / Linda Zemba Burhance. 60 quick knitted toys : fun, fabulous knits in the 220 Superwash collection from Cascade Yarns / the editors of Sixth&Spring Books. Give your creativity a fresh start with gorgeous ideas from this selection of our latest craft books. Discover some glorious designs for quilts, inspired by the rich colours of the terracotta walls and the white churches of the Mediterranean. Happy crafting! Knit together, share together : simple knitting for all the family / Marja de Haan ; translated by Barbara Mee. Knitting for the outdoors : merino handknits for active Kiwis / Gillian Whalley-Torckler ; photography Darryl Torckler. Knitting short rows : techniques for great shapes & angles / Jennifer Dassau. Easy toys to knit : cute and cuddly dolls, animals and toys / Tracy Chapman. Crochet : 20 projects for friends to make / Super+Super ; [text, Claire Culley and Amy Phipps]. Scrap quilt secrets : 6 design techniques for knockout results / Diane D. Knott. The Bible sampler quilt book : 96 quilt blocks inspired by the Bible / Laurie Aaron Hird. Kaffe Fassett’s quilts in Italy : 20 designs from Rowan for patchwork and quilting. Find inspiration and have fun browsing through this collection of newly arrived craft books we have selected for you. Add excitement to your wardrobe with some adorable new designs of scarves, shawls and wraps, read about how to make eye-catching bunting to spice up your home or check out the delightful crochet flowers made from scraps of yarn. For those of you who are interested in joining the library knitting group, you are welcome to join us at the Central Library to share your ideas and enthusiasm, with our devoted “Knit and chat” library knitters. A delicious morning tea is provided, and the latest craft books and magazines are offered for inspiration. Knit scarves and shawls now. Ten adorable teddy bears to knit : plus all their clothes and accessories / Rachel Borello. Banners, buntings, garlands & pennants : 40 creative ideas using paper, fabric & more / Kathy Sheldon and Amanda Carestio. Adventures in Pompom Land : 25 cute projects made from handmade pompoms / Myko Diann Bocek. The farmer’s wife sampler quilt : letters from 1920s farm wives and the 111 blocks they inspired / Laurie Aaron Hird. Crochet flowers step-by-step : 35 delightful blooms for beginners / Tanya Shliazhko. Find lots of ideas and easy to follow designs in this brilliant collection of crochet, knitting and quilting newly arrived library books. It’s the perfect time now that winter is approaching to knit a stylish sweater or wrap yourself up in a crochet shawl and feel warm and elegant! And if you are a pet lover, take a look at some modern and functional design ideas for your cat or dog. Until next time, happy crafting! Crochet so lovely : 21 carefree lace designs / Kristin Omdahl. 1000 quilt inspirations : colorful and creative designs for traditional, modern, and art quilts / Sandra Sider. The quilter’s practical guide to color / Becky Goldsmith. Knitted rabbits : 20 easy knitting patterns for cuddly bunnies / Val Pierce. Very British baby knits : 30 stylish designs fit for a royal baby / by Susan Campbell. Cats in hats : 30 knit and crochet patterns for your kitty / Sara Thomas. Find lots of inspiration and practical ideas in our latest library craft books. Start your crafting adventure reading about artists who are enjoying sharing their knowledge and ideas with young crafters about knitting, crocheting, sewing, stitching and hand weaving – without spending a fortune! A fantastic way to learn how to make beautiful things that work for you and your family, satisfy your creative urge and have fun! Chloë tells you how… to sew : more than 30 things to make, do, and sew / Chloë Owens. Sew bunting : simple and stunning garlands to style your home / Debbie Shore. Stitch and structure / Jean Draper. Knitting with giant needles : simple projects to knit and crochet / Hanna Charlotte Erhorn. Boycraft : loads of things to make for and with boys (and girls) / Sara Duchars & Sarah Marks ; illustrations by Nicola Kent. Wise craft : turning thrift store finds, fabric scraps, and natural objects into stuff you love / Blair Stocker. Made by yourself : 100% handmade designer DIY projects for the home, from furniture to accessories / Peter Fehrentz. The art of tinkering : meet 150+ makers working at the intersection of art, science & technology / Karen Wilkinson & Mike Petrich. It’s been an exiting time for our crafty library team, cataloguing and sorting out all these cool and ‘delicious’ craft books, which are packed with inspiring knitting, quilting, crocheting and sewing projects. If you are ready for an artistic journey take a look at some of our latest arrivals. Get inspiration with new ideas and learn great techniques through the numerous step-by-step tutorials and tips. And, there is much more… You are offered guidance on how to market your craft business, ways to engage with customers, sell your work online and move your business forward with confidence. Happy crafting! Enjoying crafting? Start this New Year with lots of inspiring ideas and smart choices found in this fabulous collection of new library books. Have fun with yarn and fabric and make use of treasured possessions to create your own piece of history. Look at some enchanting knitting designs of unique accessories, as well as, innovative jewellery, quilting and stitching projects for you and the family. Enjoy the challenge! Bead embroidery jewelry projects : design and construction, ideas and inspiration / Jamie Cloud Eakin. The sparkle factory : the design and craft of Tarina’s fashion jewelry and accessories / Tarina Tarantino. Vintage projects / Vivienne Bolton. Fun with yarn and fabric / Susanna Zacke & Sania Hedengren ; photos by Magnus Selander ; translated by Ellen Hedström. Great projects for guys / compiled by Barbara Delaney. Children’s spaces : from zero to ten / Judith Wilson ; photography by Debi Treloar. Knits from an English rose : 25 modern – vintage accessories / Louisa Harding ; [photography by Stephen Jessup]. Stitching : 35 cute sewing projects to turn everyday items into works of art / Fiona Goble. Quilters : their quilts, their studios, their stories / Jo Packham. Welcome to this eclectic mix of new craft books, featuring clever and creative ideas to help you kick off the New Year. Experience the contemporary culture of craft with gorgeous knitting, crochet and quilting projects, passed down through the generations from mothers to daughters and learn new techniques. We hope you have lots of joy with the adorable and fun to craft ‘pom-poms’ and ‘woolbuddies’ projects! Happy crafting! Modern top-down knitting : sweaters, dresses, skirts & accessories inspired by the techniques of Barbara Walker / Kristina McGowan ; photography by Gudrun Georges. Warm mittens and socks : dozens of playful patterns and skillful stitches to knit, crochet, and embroider / Eva Trotzig ; photography by Malin Nuhma ; translated by Ellen Hedstrom. Little Aran & Celtic knits for kids : 25 designs for babies and young children / Martin Storey ; photography by Steven Wooster. 101 fabulous small quilts / [managing editor, Karen Costello Soltys]. Vintage quilt revival : 22 modern designs from classic blocks / Katie Clark Blakesley, Lee Heinrich, Faith Jones. “Vintage Quilt Revival is a resource for quilters of any age or style who love to use today’s modern colors and fabrics. With fresh quilt layouts, detailed instructions on foundation piecing, and a wide variety of traditional blocks and modern projects, Vintage Quilt Revival is at the forefront of the burgeoning interest in the “traditional-made-modern” movement. “The new crochet : a beginner’s guide : with 38 modern projects / Marion Madel ; photography by Hiroko Mori ; styling by Maki Nakahara ; [translation by Ben Ross]. Vintage & retro : 30 quick projects to make for your home and to wear / consultant, Nikki Trench. “The Easy Crochet series features six new project collections, so you can find a great project, whatever style you’re looking for. Felt fabric designs : a recipe book for textile artists / Sheila Smith. Pom-poms! : 25 awesomely fluffy projects / by Sarah Goldschadt and Lexi Walters Wright. Woolbuddies : 20 irresistibly simple needle felting projects / Jackie Huang ; photographs by Antonis Achilleos.